Israel’s Secret Project: Super-Battery To Reduce World’s Oil Thirst | "Global Possibilities"
Quietly and with little media coverage, it seems that Israel has made it its national goal to develop a battery that can provide enough power for a 500 kilometer-drive with a single charge. One month ago, the Israeli National Center for Electrochemical Propulsion was founded. The center will be inaugurated within the next weeks and will receive a budget of 45 million NIS (approximately $11.7 million) for the next four years. The center will include one hundred researchers divided into 12 teams from four academic institutions: Tel Aviv University, The Technion (Israel Institute of Technology), Bar Ilan University and Ariel University Center of Samaria. The center’s sole purpose will be to research and develop new technologies to more effectively store electricity. “The greatest success of modern electrochemistry is the chargeable lithium-ion battery,” Urbach explains. “It’s a great battery for electronic devices, but for a car you’d need many of those batteries. A problem that electric car producers regularly encounter is the batteries’ limited speed of electric discharge. 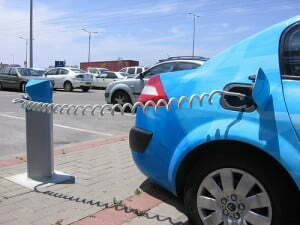 In other words – the discharge of energy in a short period of time, as required for car acceleration. The center is therefore working on the development of super-capacitors that can supply the required amount of energy in the desired amount of time. These capacitors could provide a solution to energy storage, a burning issue in the scientific community. Advanced batteries could reduce dependency on oil, coal and natural gas, which are used to produce electricity. Solar and wind, for example, are not able to continuously produce a large amounts of energy, which means energy storage is one of the main challenges for renewable energies.